Cozy serviced apartment for rent in Doi Can street, Ba Dinh district, Ha noi. Total living area is 120 sqm, designed 2 bedrooms, 2 bathroom (one with bathtub), a living room and kitchen. The living room is combined with dinning space. The apartment is equipped full furniture such as: air conditioner, wardrobes, sofa, tv, kitchen cupboard, cooking stuffs, dinning table, mattress,.. The price is 1800 usd/month including cable tv, internet, usage water, cleaning service. Please contact me at 0936 670 899 or huong@bdsmekong.vn for more information. Two bedrooms serviced apartment for rent in Doi Can street, Ba Dinh district, Hanoi. It has 65 sqm living area and composed of 2 bedrooms, 2 bathrooms, bright living room combining with kitchen. The apartment is fully furnished and well equipped. It locates on the building where has elevator for moving and sercurity 24/24. Rental fee: 650 usd/month. The price is include cable tv, internet, usage water, cleaning service. Plaese contact me at 0936 670 899 or huong@bdsmekong.vn for more information. Studio apartment for rent in Van Cao street, Ba Dinh district, Hanoi. Total living area is 40 sqm and composed of bedroom and bathroom with bathtub. The serviced apartment is fully furnished and well equipped: tv, air conditioner, wardrobes, fridge, … It belongs to brand-new building where has elevator for moving and secutity 24/24. Price: 400 usd/month ( cable tv, internet, usage water) Please contact me at 0936 670 899 or huong@bdsmekong.vn for more information. 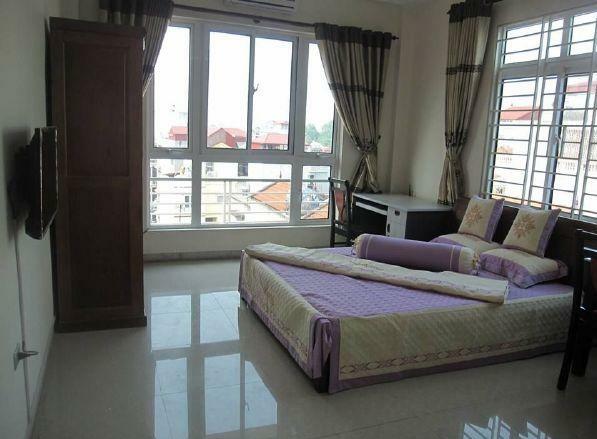 3 cozy bedrooms serviced apartment for rent in Kim Ma street, Ba Dinh district, Hanoi. Total use area is 260 sqm, designed 3 cozy bedrooms, 3 bathrooms with bathtub, spacious living room, modern equipped kitchen. The serviced apartment is full and furniture, wooden floor. Close to restaurants, coffees, shops, market, The price is 1500 usd/month, including cable tv, internet, water consumption fee, cleaning service) Please contact mẹ at 0936 670 899 or huong@bdsmekong.vn for more information.